Title: 05/16/1990 - Regarding labeling requirements order the OSHA's Hazard Communication Standard. It is really OSHA's intent that all shipments of the 1.25 billion tons of crushed stone consumed annually in this country carry some form of cancer warning because that stone may contain within its matrix some small amount of quartz material? Where the shipping container is a tank truck or rail car the appropriate label or label information may either be posted on the tank or vehicle, or attached to the accompanying shipping papers. Employers purchasing hazardous chemicals must ensure that their employees are aware of the label warning before potential exposure to incoming chemicals occurs. As you are aware, the primary purpose of the HCS is to ensure that employees are aware of the potential hazards of the chemicals to which they are exposed. Employees exposed to the "small amount of quartz material" present in the crushed stone they work with have the right to information regarding the health hazards associated with that material. Advising your member companies to include a label or label information along with the truck's accompanying shipping papers meets the intent of the standard. This practice will help to ensure that employees handling hazardous chemicals shipped in vehicles are made aware of the label warning information and will be able take the necessary precautions to protect themselves from potential exposure. Communicate workplace hazards with handy labels from Safety Emporium. What rationale supports the position that transporters of wet Portland Cement concrete or hot mixed asphalt concrete must label because the stone in the concrete might contain some quartz mineral? Certainly dust emissions from wet concrete are negligible and, therefore, the possibility of worker exposure nil. From an exposure standpoint I would be more concerned about the individual with a jack hammer breaking up a concrete sidewalk becoming exposed than I would the wet concrete worker finishing a concrete pour. Yet we are told the sidewalk is an article and therefore does not have to be labeled, but the wet concrete does. Applicability of the provisions of the HCS, including labeling and MSDS transmittal requirements, is based on the potential for employee exposure to hazardous chemicals which are known to be present under normal conditions of use. Under normal conditions of use, wet concrete is poured and then is left to set or dry. If employees' normal conditions of use of wet concrete involve exposure to airborne levels of silica that could occur with exposure to the concrete after it is dried (such as might occur during clean-up operations of hardened cement), then information on the potential hazards must be transmitted on the MSDS and label. 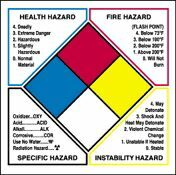 The responsibility to perform a hazard determination on a chemical product is the chemical manufacturer's. If hazardous exposure potentials could occur based on anticipated downstream exposures under normal conditions of use of the chemical product, then the material would be covered under the provisions of the HCS. Appropriate hazard information would be required on the labels and/or MSDS. Under the requirements of the HCS, exposure to silica that may occur when a worker uses a jackhammer to break up a sidewalk represents a situation where workers are to be apprised of the hazardous substances to which they are exposed The hazardous substance is known to be present (the concrete containing silica) and, while the employer is not responsible for "bringing" the hazard to the site, he is exposing his employees to the hazard. In such a situation, these hazards would need to be addressed in that employer's on-site Hazard Communication Program. Even though other provisions of the standard would not be applicable (providing an MSDS or label for that specific piece of concrete, for example, which the employer would not have access to), the employer would still need to address the hazardous exposure to the silica from the concrete in his program, since it is a hazardous chemical known to be present and one he is exposing his employees to. Workers involved in sand blasting should have a complete supplied air respirator system like this one from Safety Emporium. Lastly, you raised a question regarding OSHA's position on labeling "work stations on a public beach." The HCS requires labeling of containers of hazardous substances. OSHA has always interpreted the standard to not be applicable where there is no container. A room or open area such as a beach are not considered to be "containers" and would not, indeed could not, be labeled. The intent of the HCS, to provide information to employees about the hazards of the chemical they may be exposed to while working, is met when chemical manufacturers and employers work cooperatively to transmit hazard information to all affected employees facing downstream exposure potentials. To that end, the cooperation of all chemical manufacturers and employers who are responsible for unimpeded hazard information transmittal is of paramount importance, and I trust OSHA can continue to look forward to working cooperatively with you to achieve these goals.